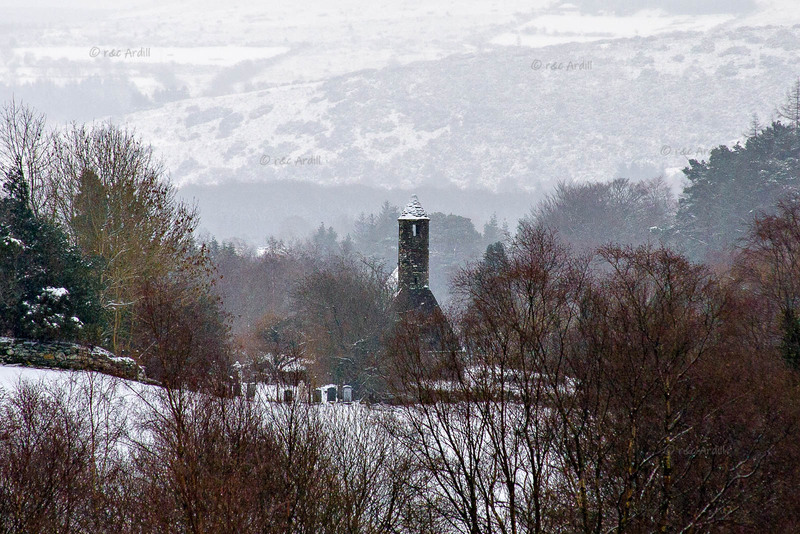 Photo of: East Coast of Ireland: Wicklow: Glendalough St Kevin's Church. Glendalough ( Irish: Gleann Da Loch, meaning 'Glen of two lakes') is renowned for its Early Medieval monastic settlement. It was founded in the 6th century by St Kevin, a hermit priest. St. Kevin's Church is a stone-roofed building originally with a nave only. The steep roof, formed of overlapping stones, is supported internally by a semi-circular vault. The belfry with its conical cap and four small windows rises from the west end of the stone roof in the form of a miniature round tower.